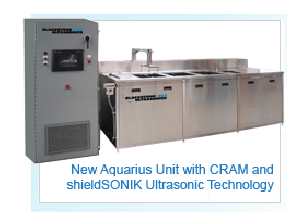 CTG multi-tank ultrasonic cleaning systems designed and built by Bla ckstone-NEY Ultrasonics provide a cost-effective option to custom designed part washer equipment in many applications. 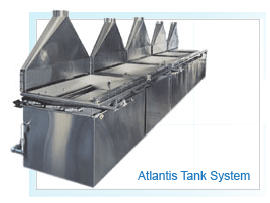 Blackstone-NEY Ultrasonics offers pre-engineered part washer systems in a variety of tank sizes and configurations to allow a "cook book" approach to meet most commonly encountered cleaning requirements. Use a pre-engineered ultrasonic parts washer system as a base and add options as required to customize a system to meet your specific cleaning and degreasing needs. Basic automation and material handling capability are readily available. When cleaning goes "critical" even the most advanced conventional ultrasonic cleaning equipment falls short of the challenge. Particles of concern often measure less than a micron in size (1 micron = 1/1,000,000 meter) altering the cleaning mind set and, subsequently, the ultrasonic cleaning equipment requirement. Blackstone~NEY Ultrasonics pioneered and continues to lead the development of ultrasonic cleaning equipment and parts washers for ultra-precision applications that incorporate high-speed automation, sanitary plumbing, QDR's, capillary, HEPA and infrared drying, filtration systems, and environmental enclosures. 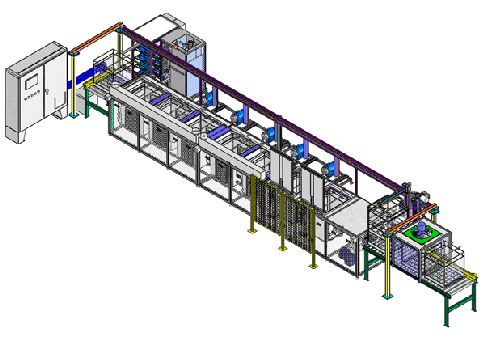 Ransohoff can offer large custom built applications to suit a clients requirements. Designs are done in solid model so clients can see how the layout looks before building. 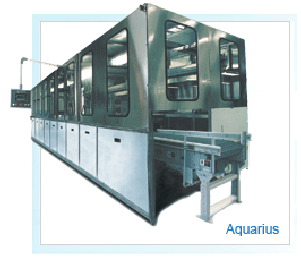 A typical layout for a multi tank ultrasonic cleaning rinsing and drying system with automatic basket transfer sytem.